The dog days of summer are officially here. The days are hot and long. The back-to-school commercials have started. The next three-day weekend seems a million days away. But in the WNBA, with a very successful All-Star Game in the rearview mirror, the dog days are also pivotal in the push for the Playoffs. With the standings tightly packed as always, it’s likely going to be one big game, or a key performance by an impact player that will make the difference between playing into the Fall or finishing early for many teams. Let’s take a look at the five players who could make-or-break their team’s playoff fortunes in the second half of the season. 1. Jonquel Jones, Connecticut. A Star is Born. Jones’ 24-point, nine-rebound day (including a late-game dunk) in Seattle in front of a national television audience confirmed what everyone in the league already knows. This young player, with her length, grace and athleticism, is poised to be a game-changer in the WNBA. She has already proven to be a game-changer for the Sun, who rebounded from an 0-4 start to jump into the thick of the playoff race and are only getting better. Jones’ play in the post jolted Connecticut with confidence and give the Sun a realistic shot to snag one of the league’s top two playoff spots. A lot of the best players in the WNBA were talking about Jones this past weekend. Jones is averaging 15.6 points and 11.2 rebounds a game and shooting better than 45 percent from beyond the 3-point arc. The George Washington product may be opening doors for players who didn’t come out of one of the country’s “Big Five” conferences. With seven wins in the last nine games, the Sun are just 2.5 games behind Los Angeles for the No. 2 spot in the league standings. Jones, the WNBA’s leading rebounder, came back from her All-Star turn to finish with 12 points and 10 rebounds against Chicago. 2. Courtney Vandersloot, Chicago. The Sky have some work to do to get solidly back into the Playoff race. With a head injury to Cappie Pondexter keeping the star guard out of the lineup over the past couple of weeks — though Pondexter has since returned — Vandersloot’s starring role in the offense has changed the direction of the season for the Sky. Vandersloot, who led her team in Turkey to a championship and missed the first seven games of the season while wrapping up her overseas commitment, is finally settling in. Vandersloot is averaging 11.4 points a game in July for the Sky, steering Chicago toward five wins in their last seven games. On July 20, in the game before the break vs. Los Angeles, Vandersloot finished with 14 points and a career-high 14 assists. 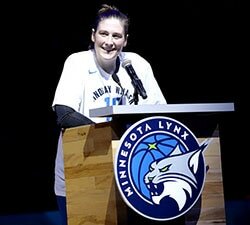 That performance pushed “Sloot” to the top of the WNBA’s leader board in assists at 7.1 per game. 3. Brittney Griner, Phoenix. Griner, you say, isn’t even able to play right now, out since July 14 with an ankle/knee injury. 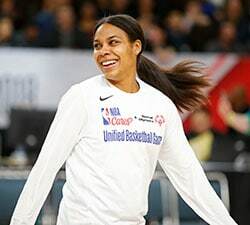 But a few weeks from now, when she’s healthy enough to rejoin her Mercury teammates on the floor, the WNBA’s leading scorer is going to make Phoenix an automatic playoff-caliber team. In the meantime, the Mercury – relying more than ever on the offensive firepower of Diana Taurasi – need to find a way to hold on to their postseason positioning. Phoenix has lost four in a row since Griner went out and Tuesday’s game in Atlanta kicked off a five-game road trip that will be a test of the Mercury’s mettle. 4. Sue Bird, Seattle. Duh, right? 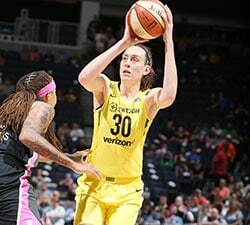 Bird’s big weekend at home in Seattle for the All-Star Game was a celebration of this beloved veteran player, who is closing in on the WNBA’s all-time assist record. But for a Storm team that’s been on a roller-coaster ride this season while trying to make the playoffs, Bird is the center of attention. Bird’s assist numbers (6.9 per game) and her field-goal percentage (46.8) are at a career-high. And she is admittedly frustrated with the Storm’s ability to show both their best and their worst over the course of this season. Seattle hasn’t won back-to-back games since May. “We are working on our consistency. That’s where our team and our younger players, and I include myself in that too, we need to be more consistent,” Bird said. 5. Brittney Sykes, Atlanta. The rookie guard is one of the breakout stars of the season already. Sykes put up 20 points and 13 rebounds vs. Phoenix, the first double-double of her career, in Tuesday’s return-from-the-break win. She has scored in double figures in 11 straight games and is averaging 18.2 points per game in that stretch. Sykes’ new momentum gives the Dream a very potent backcourt with All-Stars Layshia Clarendon and Tiffany Hayes. Sykes, fast becoming a Rookie of the Year candidate, puts Atlanta in great position for a postseason run. The Dream’s win over Phoenix was a great way to start the second half, but Atlanta is going to need more where that came from to feel safely in the playoff race.